Ready just in time for the holidays, Steven C. Miller’s loose remake of the 1984 slasher is now out on DVD, Blu-ray. While the original film was about a tormented young boy whose parents are killed by a maniac dressed as Santa, who then grows up and assumes the role of murdery ol' St. Nick, the Silent Night remake shifts focus to a local Sherriff’s department as they track down a crazed killer dressed as Santa. The movie stars Malcolm McDowell, Jaime King, Lisa Marie, Donal Logue and Brendan Fehr. 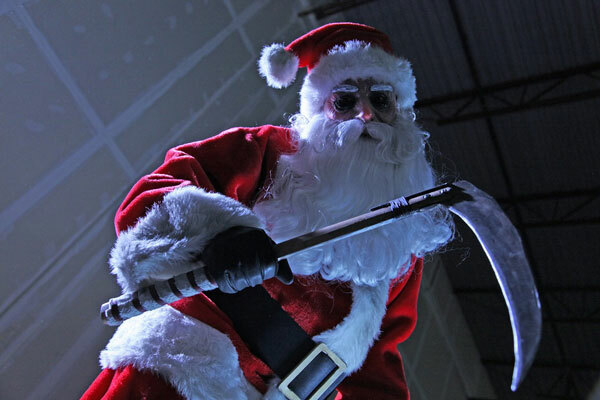 A loose remake of the horror classic Silent Night, Deadly Night, the film’s stellar cast includes Malcolm McDowell (Rob Zombie’s Halloween, Easy A), Jaime King (Sin City, My Bloody Valentine 3D), Donal Logue (Shark Night 3D, Blade), Lisa Marie (Sleepy Hollow), Brendan Fehr (Final Destination, X-Men First Class), and Ellen Wong (Scott Pilgrim Vs. The World). McDowell and King star as a small-town sheriff and deputy on the hunt for a murderous Santa Claus terrorizing their community on Christmas Eve. But with the streets full of Santas for the annual Christmas parade, the killer is hiding in plain sight. He’s made his list, checked it twice, and the naughty are going to pay with their lives. Silent Night was directed by Steven C. Miller (Automaton Transfusion, The Aggression Scale) and produced by The Genre Company and Insidious Pictures. SRP is $29.99 for the Blu-ray™/DVD combo and $24.98 for the DVD. Bonus featuresinclude “SILENT NIGHT: Behind The Scenes” featurette and deleted scenes.